In December 2010 the Adventure Club announced the All-Russia Competitions. The students of the age 16-18 years old (including the teenagers from the orphanages and remedial schools) were asked to answer the questions of the application form and send them to the Jury’s address. The indispensible condition was the participation in the All-Russia Mass Festival of the ski sport "A Ski track of Russia", and also the experience of extreme travelling. More than fifty application forms were received from the young adventure seekers from seventeen regions of Russia. The application forms of the candidates were examined by the competent Jury under the leadership of Professor Alexander Buslakov. 40 candidates were invited to come to Moscow. 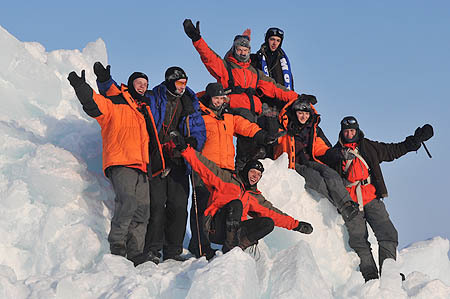 From February 25 to March 10, 2011 they took part in the training session in the Youth Camp "Great Adventure" (Karelia). The Leaders of the Expedition: Matvey Shparo and Boris Smolin.